How did we determine how many extra days are built into the district calendar? 24.5 – 18.75 = 5.75 hours Remaining After this week’s absences. Six (6) hours are needed to count for a full day. 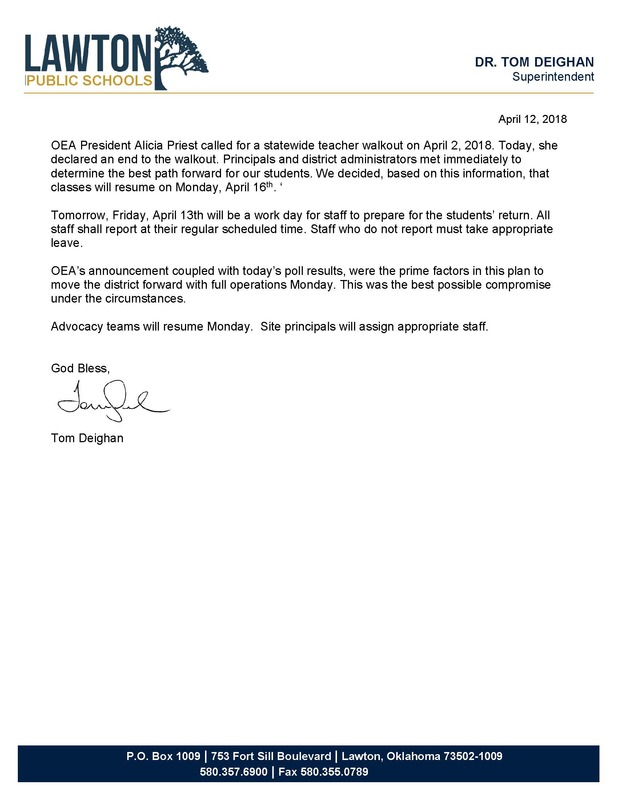 The first three days of the work stoppage on April 3, 4, and 5 will be replaced by using April 27, May 4, and May 11. All future absences (after and including April 6) will be made up by adding either minutes to the day or days to the year. Most sites will only have to add a few minutes to make up for April 6, 2018. Three sites will possibly have more minutes to make up due to closures earlier in the year for emergencies. No one can predict exactly how this will unfold until we know when the work stoppage ends. Staff has expressed a preference for adding minutes as the first option to make up missed instructional time. 1.If the work stoppage continues Friday April 6th, all 12 month employees should report to their usual work location at their usual time. 3.Supervisors will hold informational department meetings upon employees return to work. Due to low attendance or zero participation, these LPS feeding sites will be closed: Eisenhower Elementary, MacArthur Middle School, Pioneer Park Elementary, Tomlinson Middle School Whittier Elementary, Washington Elementary and Woodland Hills Elementary. These sites will not open tomorrow. Adams & Crosby Park Elementary will serve lunch only. Each closed site has listed an alternative feeding location near their site. It will be posted on the entry door of the school. Any child under 18 will eat for free. Issues relating to the provision of instructional and related services to students with disabilities pursuant to the IDEA. Information Regarding FAPE, IEP/Re-evaluation timeline and Testing can be found on the Oklahoma State Department of Education's website. Click here for more information and read items 5, 6 and 7. There have been several questions about the results of the staff polls taken daily this week. We wanted to share some information in hopes of answering as many as we can. The results are shared daily and immediately after the poll closes at 5 p.m. each day. These results are posted below. In order to ensure all staff members have their voice heard and maintain continuity in communication from the district, results will be posted after the polls close and not as the poll is live. This is to ensure transparency with all stakeholders - staff, students, parents and community members at the same time. We appreciate staff taking the time to answer each poll daily and will continue to work hard for our staff, students, parents and community! Thank you.